What's the point in posting, I wondered. The photo is the same, the blind hasn't moved, the glare that comes off the water every morning means that it's impossible to get a properly exposed shot, and the green tinted glass means the colour balance will never be right. Then we looked and realised (as if we didn't already know) that the house changes when we have visitors. 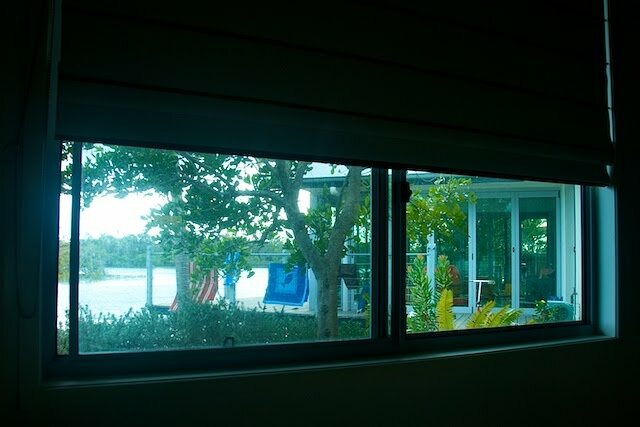 It isn't a comfortable nest for a pair of almost retirees, it becomes a beach house with towels and sand and scooters and surfboards hanging round. And to top it off, the first words I heard this year were from the floor near my bed: "There were fireworks Papa! ", and there were, we watched the early session at least from the verandah by the beach towels. Well we watched those that rose above the mangroves anyway, and we didn't have far to go to bed. I don't remember another year when we didn't make it to midnight. Interesting project. I have something similar but totally different. This is reminiscent of x's tree that he photographs on a very regular basis, year round. Hassles: in your sidebar you tout daily postings and define this as Monday and Thursday. Very cute. Very Qld. I think this will work very well given all the changes you already know are in store for you during twenty ten. Day two and I reckon I'm done! We'll see. Just as well Blogger is cheap eh?